It feels like I have to relearn how to survive winter every year. In Arkansas (and Texas before that) we get cold weather for a relatively short period every year - Late November/December through March, maybe, and then it is spring and even if it is sometimes cold, the sun is out most of the time - that by this time of it year it has been almost nine months since I was truly cold. That means I have had almost enough time to have had a baby since I last had to layer on a daily basis. I can hear all my northern friends laughing and rolling their eyes at me, and I suppose it is their turn. After all, I do the same every summer when they start moaning about how hot it is. And don't get me wrong - I don't dislike this weather, I just have to become reacquainted with it. Now, I think I need a cup of tea! After the last week, it seems a bit odd to be writing up a report for a race that feels like it happened in another world; I honestly don't have much to say about anything right now, but I will try. 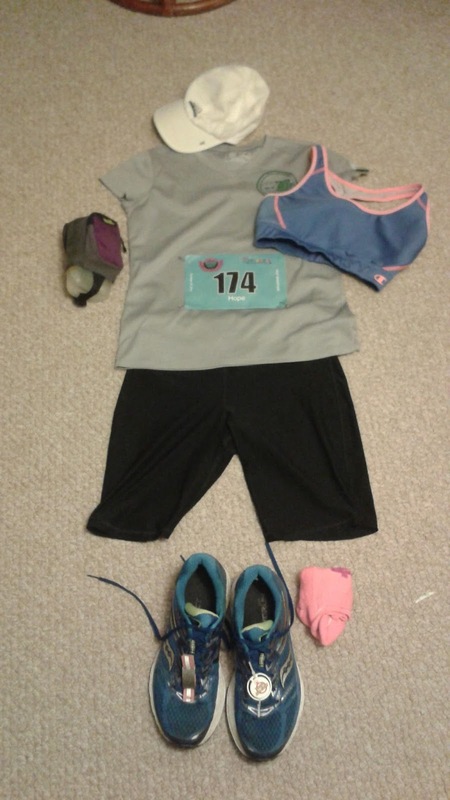 I prepared my clothes the night before, since I had to get up around 5 a.m. to have time to eat something and drive to Conway and have time to use the restroom. For you non-runners out there, this is a very important part of race day - almost any book or column about racing will have something to say about it. 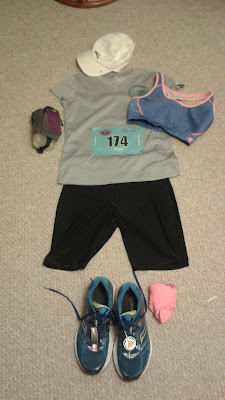 Anyway, I didn't want to forget anything important, so I laid out my clothes, pinned my bib on my shirt, packed my bag with extra clothes, a towel to sit on after the race, energy gels, water, and phone, and tried to go to bed early. I was less than successful at that - I was already having trouble falling asleep, and then Benjamin, on a business trip, called in a bit of a panic and needing help contacting his hotel, since his plane had landed very late. Of course I couldn't sleep until I knew he arrived safely, so I got to bed about an hour and half after I intended. Compared to the Little Rock Half in March, this race was quite a bit smaller and far less intimidating, at least as far as the number of people went. The course was quite a bit hillier than Little Rock though, and given my times while training, I was just hoping to stay close to my previous time. I also planned to run with my heart monitor on, to keep me from going out too fast or not pushing hard enough later, but when I tried to pair it with my watch, I got a message saying its battery was dead! Great timing! If only it had died on my last training run the day before! I had to stuff it in my waist pouch, along with my phone; in retrospect, I probably had time to run back to my car and drop it off, but I wasn't going to risk missing the start, or wasting my energy. I started out with a pace group that was right about where I thought I would be, and was able to stay with them for a while, but the leader was going a bit faster than his stated pace, and I quickly fell behind. 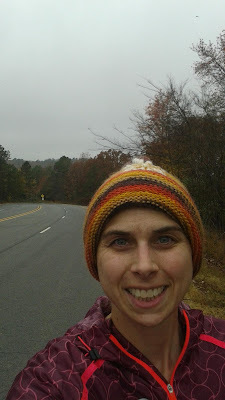 After a couple of miles, I just tried to keep myself going at a steady pace even with the hills. I had to stop and use a toilet at mile 4 - something I managed to avoid in my previous half - and that dropped me even farther behind that pace group. After the pit stop though, I was more comfortable and was able to make up some of the time I lost. Around mile seven, my left leg started to ache in the knee and hip, something that was new - usually it is my right hip complaining. It wasn't so bad I couldn't run, but it was definitely an unwelcome distraction. Eventually, I decided it must be from the slant of the road - we were running on the right side of the road for much of the race, which had a slight but definite angle to it, and I think it was enough to throw off my alignment. I tried running a bit more towards the middle, but there were a lot of stretches where we were supposed to stay in a lane about the width of a sidewalk. When we reached the split for the marathoners to head off in another direction, I was once again grateful that I was not going with them. 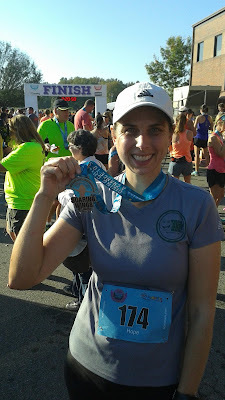 My hip and knee hurt, my stomach roiled at the thought of any more gels or sugary chews, and while I was having a certain amount of fun (if deliberately torturing oneself can be called fun), I was ready to be done. I had some kick left in me, and picked up my speed a bit in the last mile or two - I accidentally started my charge a little too soon when I got excited on a downhill that was a little farther away from the end than I thought and had to keep pushing when it leveled out. In the end, I finished only about two minutes behind my previous time, and given that my watch said I had run 13.4 miles, instead of 13.1, maybe I actually ran about the same. (Yes, I know, watches are not as accurate as whatever devices used to measure courses, but race directors have been known to make mistakes about length.) Anyway, not as slow as I feared I could be, and given the hills, quite good. I have already signed up for the 2017 Little Rock Half Marathon, and am looking forward to running it again, but I am reconsidering my plans to run a full marathon next year. I'd like to say I have done it, and I know I can do it, but I am not sure I really want to right now. Two hours of running seems like enough, and given my (lack of) speed a marathon would take me around 4 1/2 hours. Maybe for my 40th birthday in a few years, or my 45th.